Oh...no... another cookie posting :) This will be the last one for this year. I promised. I made this with Choy when came to visit me last week. This cookies is really buttery, soft and melt-in-your-mouth. You can put any kind of jam on it. You can even fill it up with Nutella but you have to bake the cookies first and then only fill it up with Nutella. 1. In a mixer cream butter and sugar until well combined. 2. Add in vanilla and slow down the speed of the mixer. Add in flour and salt to the butter mixture. 3. Mix until the dough come together and well combined. 4. Roll out cookies dough into small balls and place cookies on cookie sheet pan. 5. 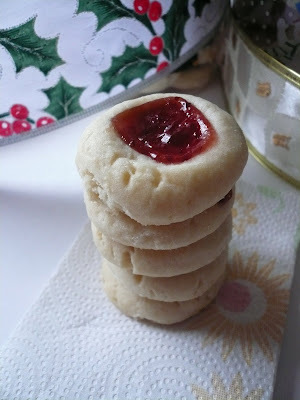 Press a light indentation on the top of each cookies with your finger. 6. 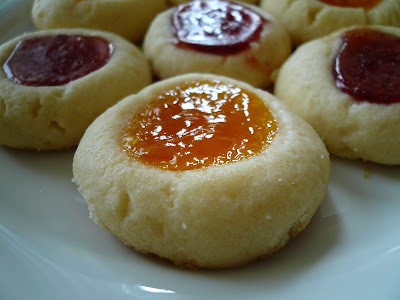 Drop 1/4 tsp of jam on each indentation. 7. Bake cookies on a preheated 325 degree F oven for 20- 25 min or until lightly brown. i just added you on my foodie blog roll :-) have a nice day!! Oh my goodness, what lovely cookies you had baked there. Looks like a gem stuck in a cookie! nicely done. I remember this cookie from last year. It went away from my tray really fast!! Ah, another cookies... I'm loving it all... Your White Choc Macadamia cookies are all gone now... Safe and sound in my tummy... HAHA! dhaggit, thanks for stopping by. Rita, this is one of my fav beside the russion tea cakes. Those are really lovely cookies. Saw those that you sent over to catcat. daybab, 1 1/2 cup of butter is 340 grms. I am making these now and my batter is crumbly....any suggestions? Seemed like a lot of flour to me. Anon, It should not be crumbly as the recipe called for 3 sticks of butter for 4 cups of flour. It should be a pretty soft dough and you can roll the dough out easily. You might not have cream the sugar and butter enough. The only way you can salvage the dough is to add a bit of cold water to it. Are there supposed to be eggs in this recipe?? I tried making it and it was extremely dry, so I added 3 eggs and it turned out perfectly. I made these cookies and the dough was EXTREMELY dry, so I added 3 eggs to it. But I didn't see eggs in the recipe. Are there supposed to be? Anon, please refer to the above answer. hi, just wondering approx how many cookies this recipe yields?